Kajakk gjennom sentrale Stockholms øyer under dette 2-timers eventyret. 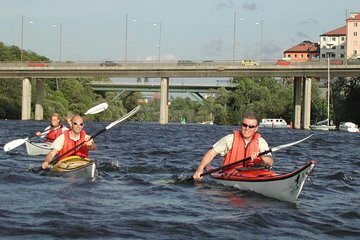 Enten du er nybegynner eller en erfaren kayaker, ser Stockholm fra vannet, er en fantastisk måte å se byens viktigste landemerker. Møt din ekspertguide i en av Stockholms rolige, beskyttede bukter for å lære eller børste opp på hvordan manøvrerer en kajakk, og deretter ut gjennom byens sentrale vannveier. Pass Kungsholmen og se rådhuset, Riddarholmen Kyrka, Gamla Stan og Södermalm. Padle rundt Stockholms sentrale øyer og broer for å se hvorfor det er kjent som "Venezia of the North"
Møt din guide på Pipersgatan 45 / Barnhusbron og delta i en kort sikkerhetsopplysninger og orientering på tørr land. Enten du er en erfaren kayaker eller en nybegynner, ser Stockholm ved vann en fantastisk måte å få et perspektiv på som de fleste turister og besøkende savner. Start kajakken din i en av byens mest beskyttede bukter for å trene litt før du legger deg på eventyret ditt. Ta gjerne spørsmål til din ekspertguide, deres jobb er å sikre komfort og sikkerhet. Padle ut i bukta, beundre den interessante blanding av moderne og vintage arkitektur som utgjør byens eklektiske nabolag. Du vil se landemerker som Stadshuset, Kaknästornet, det middelalderske nabolaget Gamla Stan, en tidligere militærbase som nå er vert for den årlige Stockholm Jazzfestivalen. Etter to timer med å utforske en av Skandinavias mest levende byer med vann, gå tilbake til avreisepunktet ditt. Amazing, so much fun to paddle around this city and seeing it from a totally different view than normally you would. Very much worth it! Be aware that it does require some effort to paddle but on a beautiful day there is nothing better that ti be on the water. Really cool tour. The guides, Johan and Felix were really friendly and had a good sense of humour. The tour wasn't overly comprehensive, but covered a lot of Stockholm from the water and, being on a few tours before, all of the information was new, so that was great! Kayaks were amazing and in good condition, and it was such a unique way to see the city. Well worth it. This is an excellent activity to do in Stockholm. I've done bike tours, and this is an excellent way to round it out form a different perspective. It got a bit choppy in the open water, but was still great. We didn't really stop much, so maybe a few other points of interest would be better, but overall was a great set up and experience. I'll definitely do this tour again, and bring friends to do it as well. I should note there aren't any lockers or anything to leave belongings, but they do have a sort of cage that is locked up. Hence, you can bring a bag and put your stuff in the locked cage, or put it in your shoe and leave them in the cage. You also don't need any special clothing, but be prepared to get somewhat wet. You don't need anything for your feet, we all went barefoot. Joachim not sure of spelling was very calm in keeping our little group together as we navigated through the fresh water with different skill levels. It was a great day which makes for a pleasant experience. I ended up being the only one on the tour, but it was a lot of fun. The guide was very knowledgeable and had lots of recommendations for things to do. Just a really cool opportunity, how many people can say they went kayaking in Sweden? Great tour, would definitely recommend! One of the highlights of our visit to Stockholm. Wonderful way to see the city and learn about its history. The guide was phenomenal. Was not at all difficult. I took this tour towards the end of my trip and am glad I did. Seeing Stockholm from the water was a great way to understand how the islands are connected and what I missed by walking and biking. So I used the last few days to get to things I learned about on this trip. Our tour guide was very helpful, informative and pleasant. We saw a variety of areas of Stockholm and learned much more about Stockholm's historic from the perspective of its water roots. I highly recommend this tour. Great way to see Stockholm, well organised and brilliant in great weather. Excellent. Our guide, Morgan, was extremely good not only in showing us how to paddle since we were all beginners but also took us around and provided a lot of useful information. I definitely recommend the tour.